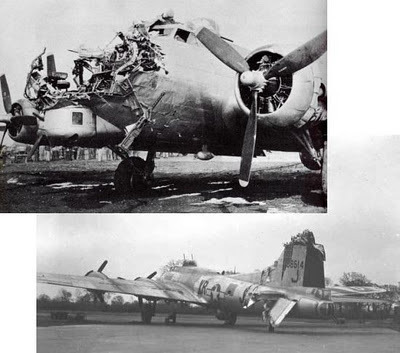 25% had damage to the nose and cockpit area. The aircraft engineers could only add extra-armour to one part of the plane, any more armour would limit the aeroplane in other ways e.g. : making it an easier target or unable to carry its deadly-cargo. Where would you add the armour? If you wanted to do your best to ensure that plane and its crew returned, where would you place the bet? The story goes that the answer relies on 2 more pieces of information. Firstly, the flak could affect any part of the aero-plane, and didn't tend to always affect one part more than another. The second, was that the engineers data is not the full picture. It suffers from a [literal] survivorship bias. What about the planes that didn't come back? What parts of the aircraft are not listed in the engineers reports? For example, the wings are not mentioned above. The idea is that the most critically damaged aircraft never made it back to the engineers. These would never be recorded in the statistics, and so the damage reports tended to show an almost inverted view of what needed to be armoured. That is, if a plane received damage to its wings - it never came home. The wings needed the armour most. This is a situation I've witnessed in software testing. The phenomenon can exhibit itself in many ways. For example a simple mis-use of metrics, does feature X have 10 bug reports recorded against it? but but feature Y has just 2? Maybe feature Y isn't less-broken but so broken that no-one can use-it well enough to find more bugs. While the 'buggy' feature Y is popular and receives a lot of attention from its users, reporting the quirks and bugs they see. A more subtle example might be, in a performance test, one server appears to display fewer errors. Maybe that server has the 'right' configuration, or its hardware is better: lets make all our servers like the 'good-one'. But it could be that this server is mis-configured or mis-managed in some way. Perhaps its not taking its fair-share of the load - forcing an overload on the other servers. In this case approaching the results skeptically might in fact save you from mis-interpreting the results, and propagating a 'bad configuration' just because it seemed to help in one scenario. For a tester, the simple heuristic that your apparent results are just that: apparent, to you. They may in fact represent, as above, an entirely 'negative' image of how the software is actually behaving. Its worth spending some time testing your tests, because how do you know you haven't got the 'wrong end of the stick'? I hope I haven't trivialised an important albeit dark aspect of european history with this post. I hope I have helped to use the information learned for a better purpose. For those interested in some of the effects of the allied bombing on continental Europe you wish to start reading about the Bombing of Dresden. You may also find articles concerning The Blitz of interest.